This morning the Cetacea travelled to the Southwest corner of Stellwagen in a thick fog. It took a while for us to find anything because we had such poor visibility! We had a brief sighting of a finback whale, but we lost it almost immediately in the fog. 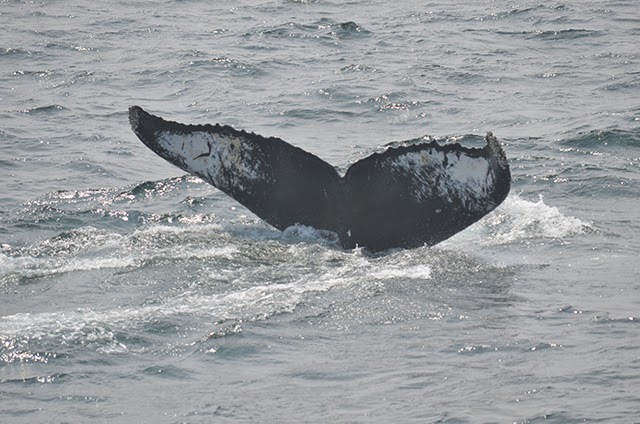 Luckily, shortly after spotting the finback, we happened on some humpbacks. 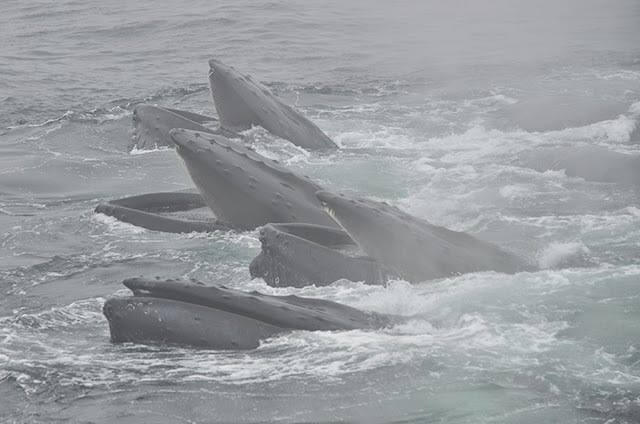 As a few other whale watch boats appeared in the fog, more and more humpbacks appeared as well! 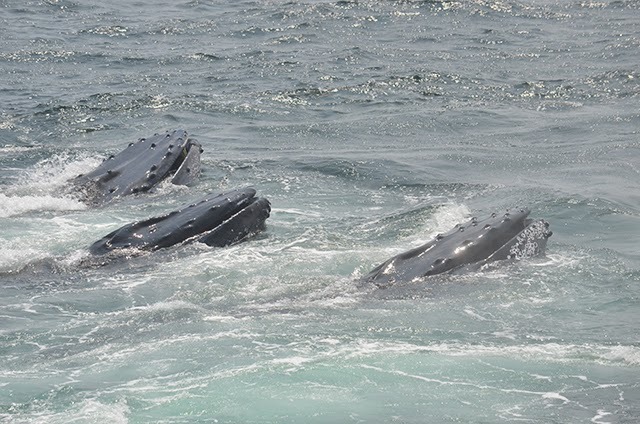 Throughout the trip there were at least 14 humpbacks in the area. 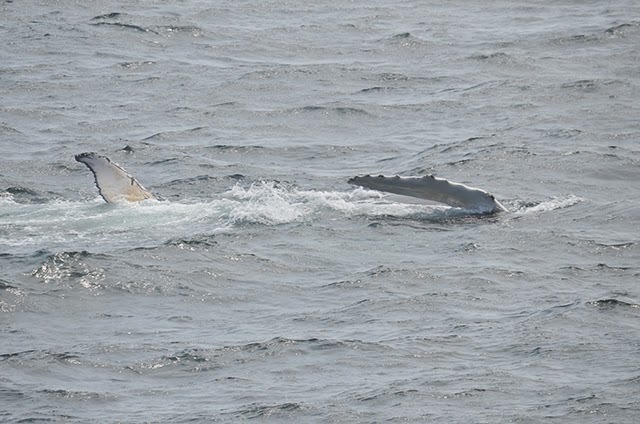 At one point there was a huge group of at least 8 associated humpbacks that collectively made 3 huge overlapping bubble rings right next to our boat! It was awesome to see them all come up to the surface with their mouths open! Our patience and perseverance searching through the fog definitely paid off! On our way out of the harbor on our 1:30 trip we had a great sighting of the Charles W. Morgan on its historic 38th voyage. It used to be a whaling vessel, but presently it is taking a tour through Stellwagen Bank and paying tribute to our changing relationship with the seas in regard to whale conservation. On our trip we travelled to the same area in the fog. 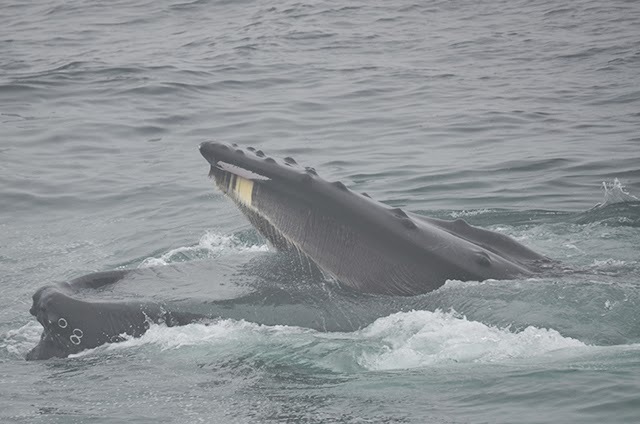 There were lots of humpbacks once again doing lots of associated open-mouth feeding. 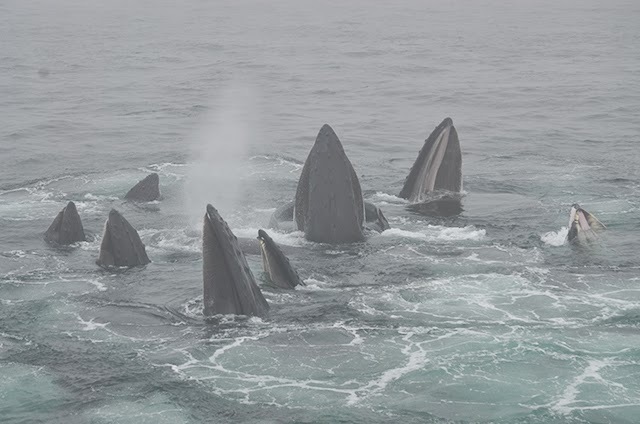 The baleen is clearly visible during open mouth feeding—despite all the fog! 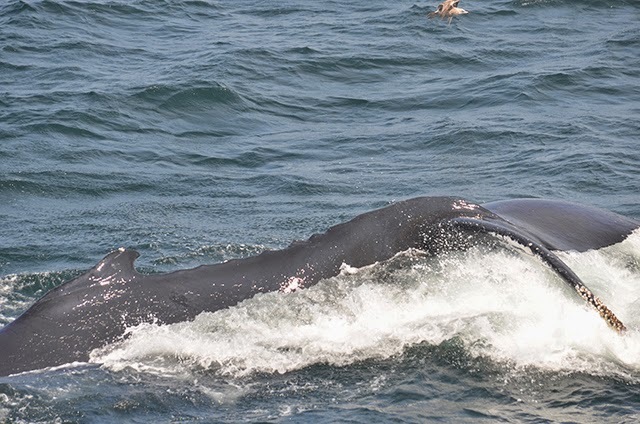 Passengers were excited to see whale activity in all directions! After the trip we were able to ID a few whales including: Octave, Draco, Wyoming and Bayou! Bayou has an unmistakable fluke with a very mangled right fluke. Today was great despite the fog! Great day on the water! 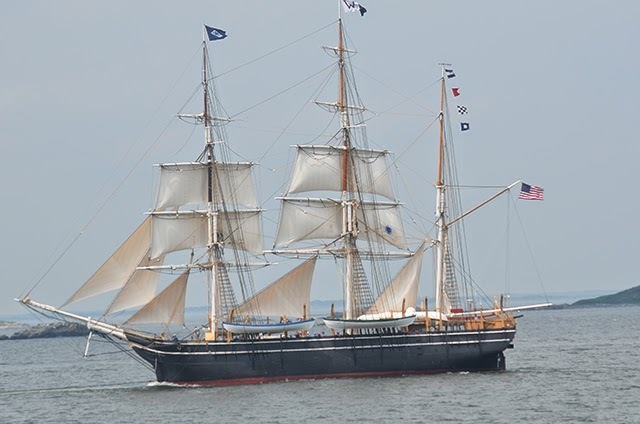 On today’s 12pm whale watch aboard the Aurora, en route to some reported whale sightings on the SW corner, we passed by the last original U.S. whaling ship, Charles W. Morgan, coming into Boston as part of her 38th historic voyage. Built in 1841, this historic landmark has been restored to honor its heritage and celebrate our changing relationship with whales. Quite fitting today as we traveled out today to enjoy the whales in the Sanctuary! 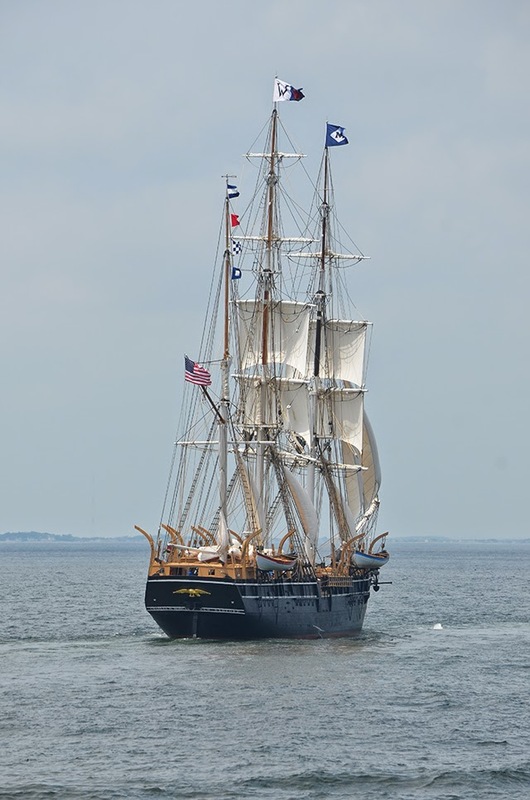 Learn more about the 38th voyage of the Morgan. After passing the Morgan, luckily the fog burned off a little for us to be able to spot some splashing of kick feeding in the distance, right west of the SW corner. We first spotted Reaper and 2014 calf. We observed Reaper doing some excellent kick and bubble feeding. Reaper gets her name from the grim-reaper stick marking on her tail. This pair gave us great looks, her calf even bobbed up a bit next to our boat! Reaper's name comes from the scythe mark on her tail. Can you see it? It seemed to be a kick-feeding kick-off today as we then spotted Habenero kicking with Buckshot feeding alongside her. 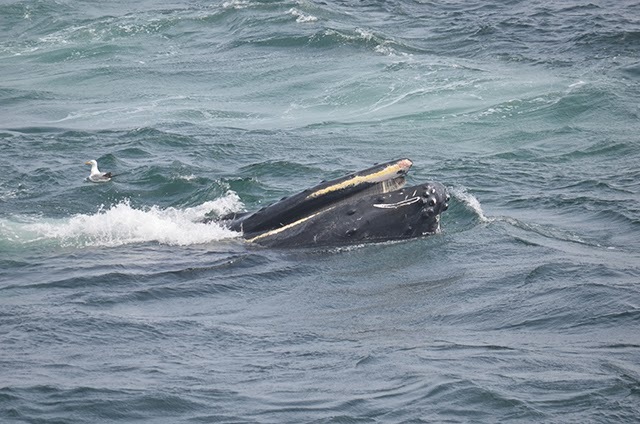 A third unknown humpback traveled by this pair, perhaps acting as a “mooch” by trying to get some of the leftovers, but not actually joining the group. After this the whales began to get into a scattered kick & bubble feeding frenzy of about 10 humpbacks with multiple splits and joins. These ID’s included Tear, Fern, Buckshot, Habenero, Nile and calf, and Reaper and calf. At one point we had Nile, Reaper and calves kicking/rolling on our one side of our boat (see photo above), and a group of 3-4 bubble feeding on the other side—a fantastic sight! On our last looks, we observed some bottom feeding scarring (read about this kind of scarring in this previous post) on the mouth of one of our individuals. On the tip of the mouth you can see the recent red scarring, and the yellow coloration is from diatom plankton.